I’ve started to upload my photos from our four weeks in Peru to my Peru, July/August 2013 set on Flickr. Hazel’s photos were online within days of our return. 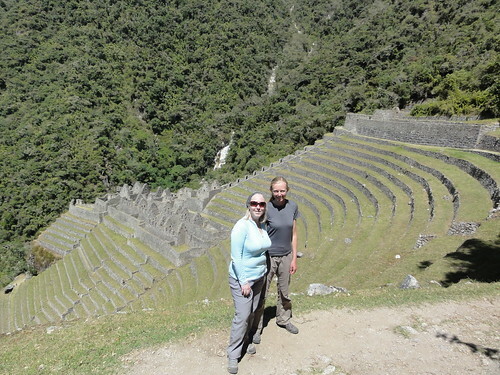 Read the backstory here, but in summary we were booked on two trips with KE Adventure Travel, the Cordillera Huayhuash Circuit and the Inca Trail to Machu Picchu, the first led by the fantastic Val Pitkethly. Our Peruvian adventures commenced with a few fits and starts: for some reason we’d been unable to do online check in for Iberia’s LHR-MAD and MAD-LIM flights, and at LHR T5 the check in machines told us to go to the Special Assistance desk, where the attendant blithely said it was probably because the flight was fully booked. URK! Fortunately that proved false, but hiccup No 2 was a delayed departure from LHR, which meant we only had an hour to make the connection with the onward flight to Peru. Luckily about half the plane were in a similar position, and so the Iberia team arranged for buses to meet us on the tarmac and take us to the South American departures terminal. We made the flight with about 20 mins to spare, and (I think) bypassed the ‘leaving Europe’ customs/passport control. Our overnight flight to Lima featured an Iberia plane with amenities tailored for sleeping – old school TV screens that lower down from the ceiling, showing only one ‘family friendly’ film at a time. Not very engaging – but probably a good thing. Landing on time at Lima’s Jorge Chavez International Airport – 05:25 or there abouts – we were met by Val’s taxi driver, Alberto, who drove us to Miraflores along mainly silent streets – we were only to appreciate how unusual this is on our return to Lima at the end of our trek! Val was at the Faraona Grand Hotel to meet us, and we sat and chatted for a while, hoping for early access to a room. Sadly no go, so around 8am, Val took us and fellow trekker Mike on a tour of Miraflores, which focused on finding a coffee to kick start the morning, and getting hold of some Peruvian Soles. Tricker than it sounds, (no) thanks to our UK banks. As others on the trip were arriving through out the day we had the whole day in Lima, which we spent pottering along Miraflores’ promenade (which felt very Bournemouth-like at times – I don’t think it was purely jet lag! ), watching the surfers and the huge flock of sea birds diving into the bay. After lunch in pure vegetarian style at Bircher Benner (recommended), we made our way back to the hotel, happy to find we could get into our rooms. Time for a shower, a repack, and some trashy TV in an attempt to stay awake until the 6pm group meeting and reviving Pisco Sour. Dinner at Les Tejas, a short stroll from the hotel, provided a chance to chat with our fellow trekkers as we dined al fresco with grills of various kinds all round. Not surprisingly, a good night’s sleep. A long day’s drive to Huaraz, our base in the Andes (Ancash Region). The first leg took us north along the coast, on Peru Highway 1 aka the Carretera Panamericana as far as Barranca where we stopped for lunch at Cheto’s before driving a little further north and turning east/inland and starting the slow ascent along the valley of the Rio Santa and up to Huaraz, which would take us from from sea level to just over 3,000m (~10,000 ft). En route we passed corn cobs and chillies drying in the sun as the heavy banks of grey cloud that loom over Lima and the coast gave way to blue skies. A couple of hours before arriving in Huaraz we drove over the Punta Conococha (Punta Quñuqqucha), which at 4,100m was our high point of the day – literally and physically. Beautiful views of the mountains (albeit not the Huayhuash, which were shrouded in cloud – I think Qiwllarahu the main one we could see), the river and reflections of Conococha lake, and shortly after we stopped at the San Francisco statue to make the most of photo opportunity, and to discover how short of breath we all were at altitude. I took a lot of photos. Our base in Huaraz, the Hotel Colomba, was a lovely old colonial building, only a block or two from the town centre. Having settled ourselves into our spacious rooms with views out over the gardens, most of us opted to relax in the gardens with copious cups of tea until it was time to head into town for dinner, which saw us struggle to keep up with Val as she led the way (not at high speed!) to El Rinconcito Minero – definitely my favourite of the places we ate in Huaraz; tonight’s choice for me was a very tasty veg fried rice (which I think Marian and Yvonne dreamt about most nights thereafter). After a fine breakfast at the Hotel Colomba, we set out on foot to take in the sights of central Huaraz, and then started a slow climb up towards the swimming pool and adjacent cemetery and thence out into the fields and pastures above the town to Mirador Rataquenua. From the Mirador’s giant bright yellow and blue cross we had crystal clear views out over the town and the Rio Santa valley, to the snow clad peaks of the Cordillera Blanca, including Huascarán (Peru’s highest peak at 6,768 m / 22,205 ft), Huandoy / Wantuy, Alpamayo / Allpamayu / Shuyturahu and more. After lunch at Café Andino (VG for herbal teas, proper coffees, carafes of home made lemonade, tasty paninis and irresistible chips), we had the afternoon to potter around town, and to relax in the gardens back at the hotel. Many more polystyrene cups of coca tea were consumed to assist our ongoing acclimatisation. For dinner, Val led us to the Bistro de Los Andes, with its lovely first floor views out over the main square, the Cathedral and the souvenir market (very good value – I should have spent some Soles there!). My thai green (veggie) curry was tasty, but somehow not as good as last night’s veg fried rice…. Our second day’s acclimatisation in Huaraz saw us head out of town, past the smart residential district built for the people working for the mines, onto unpaved roads and out through the older villages and farmland beyond. Our minibus coped brilliantly with the ever narrowing, winding route, until we approached our drop off just past the last village, when we stalled on an uphill section and rolled back, almost into a drainage ditch. Much excitement (of varying kinds) ensued. Eventually it was agreed that the ladies should start off on the morning’s walk, heading east towards the Quebrada Llaca, a gap in the Cordillera Blanca that lies within the Parque Nacional Huascarán. Having walked back to the village to get planks and successfully getting the minibus out of its hole, Val and the chaps followed in our footsteps. A lovely morning’s walk, rising to over 4000m, with beautiful landscape all around us: luring us ahead were the imposing snow tops of Ranrapalca / Ranrapallqa (6,162 m) to our right and Ocshapalca / Uqshapallqa (5,881 m) to our left, on the lower slopes sheep were grazing and to our east rose an imposing ridge. All around us we could find colourful examples of High Andean flora (including lupins! ), and as we rejoined the road for a short stretch we walked between Queñuales / Polylepis (paperbark) trees. Yesterday evening en route to dinner we’d bought bread rolls from a local lady outside one of the town’s supermarkets which had supplied a block of cheese and some oranges, and stopping for our picnic lunch today we were rewarded with fantastic views from our gorge/ous location – looking back the way we’d come we could see Huaraz down the valley and the high mines cutting into the hill tops above, and head of us loomed the snowy, fluted ridges of Ocshapalca / Uqshapallqa with Ranrapalca / Ranrapallqa and its thick duvets of bright, white snow peaking snuggling up from the south. After our picnic, we didn’t continue on to Laguna Churup but instead retraced our steps back to the minibus. Back at base, after a kit check by Val, we packed and then headed into town for a mooch and to (at last!) withdraw some funds from the bank. In the town square, we had our first encounter with the build up of festivities in anticipation of 28 July when Peru celebrates its Independence day (Día de la Independencia) in great style, with the additional excitement of Huaraz’s own 156th birthday celebrations. The town was holding its first Battle of the (Brass) Bands, with three groups facing off, literally, two at a time at either end of the stretch of the main street by the main square. Amongst the town residents we saw an occasional visiting villager in more traditional dress – including high hats and full skirts. The music brought back memories of Bolivia. We rendezvoused for dinner at Crêperie Patrick, where Val treated us to a Coca Pisco Sour – no wonder sleep proved elusive that night! An early morning, but we managed to fit in all the tasks – breakfasting, stacking rucksacks in the ‘left luggage’ store to await our return, carrying kitbags and tents to the Hotel Colomba‘s ‘car park’ – by 7am to allow us to get on the road before striking hospital workers potentially blocked the streets. A good plan in any event as the day’s journey started with a 5 hour coach drive to get us closer to the Huayhuash. The first stretch was the familiar road back to Conococha / Quñuqqucha, where we stopped for a lakeside leg stretch and loo break before heading onwards towards the mountains…. with a fantastic photo opportunity as we started our descent towards Chiquián / Chiqllan – in the valley below, a proverbial patchwork of terraced fields cultivated out of the hillsides, ahead and above the snowy peaks of the Cordillera Huayhuash, Yerupajá standing clear. After an early lunch (elevenses really) of soup and steamed potatoes in Chiquián / Chiqllan, we left the tarmac and zigzagged on for a couple of hours to Quero, where, on the banks of the Río Quero we unloaded our coach and lorry and met our donkey train. We walked up through the village, and on upwards following the river’s route. Pausing on a shady bridge to lunch on cheese and tomato sandwiches, we then continued our ascent on paths running along the river valley. As we approached Marhuay, hillsides turned into stone walled fields, and crossing the river below the village we made for the school playing fields where we’d be camping. Our trek crew and donkey train, led by Melky and Antonia, arrived a little later, and after helping to put up the tents and settling in, most folk grabbed wash things and made for the local washing ponds, fed by the freezing cold waters of the stream, cleaning off the day’s sweat and suncream just before the sun disappeared below the hill tops – at which point the temperature dropped a noticeable notch or two. Tea and biscuits in the dining tent at 5 o’clock segued into dinner at 7pm and we were in our sleeping bags not long after 8 o’clock, setting the timetable for the rest of the trek. Not even the traditional fiesta tunes could keep me awake. Having survived our first of 14 nights under canvas, we breakfasted in the dining tent then started out under grey clouds and a few spots of rain. Crossing the stream we walked through a still sleepy Marhuay and then on along a path between dry stone walls that surround the village fields. Leaving the village behind us, we made a slow but steady ascent towards the cloud-cloaked Quebrada Parlash (or Quebrada Radiash as the trip notes would have it). It was still only mid-morning when we arrived at our campsite – the villagers get to decide which of the possible sites we can use, and this time we’d been given the closer of the two, set amidst the shallow meanders of the Río Parlash. With the skies resolutely grey, Val sent us with Juan on an acclimatisation climb up one side of the valley. It was very much a “straight up” route, paths picked out by the sheep that graze the hillsides. Hard going. Still, I eventually made it to the pass – I can’t remember how high it was (4,600m maybe?) and I clung to the dry stone wall lining the narrow notch in the ridge, steep drops down either side, vertigo in full effect. Technicolour scenery though – a taste of things to come. A speedier descent, with sunshine and showers generating a rainbow down in the valley below, and we found lunch waiting for us – soup and sandwiches proving very welcome. We had the rest of the afternoon to ourselves – the cloud kept it cool and I suspect Hazel, Val and I may have played the first of many games of dice, cards or scrabble to while away the time until tea / dinner / bed. 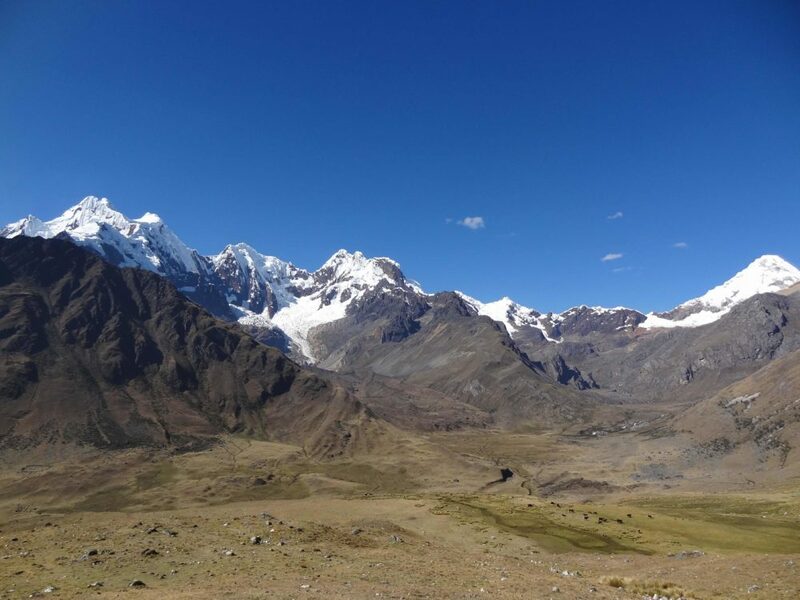 A long, but lovely day, in which we got some smashing views of the Cordillera Huayhuash and covered some steep terrain directly (up and over Punta Sacsa – or Sacra or even, looking at the map, Paso Pasapa Shimin?!) and indirectly (contouring along the steep slopes of Quebrada Milu valley between the day’s two passes). A chilly start as we continued up the Quebrada Parlash, following the Río Parlash to the head of the valley. Out in the upland pastures, our path was decorated with woolly white cactus sporting bright red flowers, and on the sides of the valley dry stone walls enclosed sheep and cattle pens. At the end of the valley we swung to our right, and after a breather (and a round of Jelly Squirms) we started the first steep ascent, which eventually flattened out amidst fossilised coral rocks, and on weird slightly squashy but very tough star shaped green ground cover. As our donkeys took a different route (we saw why as we climbed up to Punta Sacsa / Paso Pasapa Shimin! 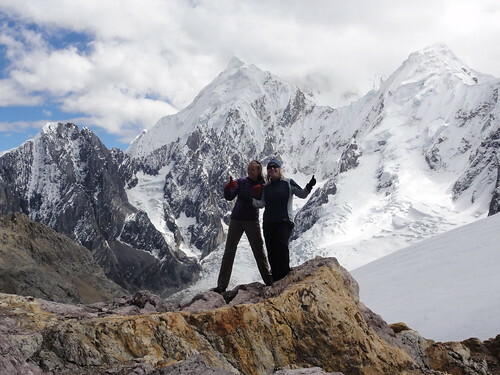 ), we posed for photos by the lovely Laguna Sacracocha and very shortly after at the Punta Milau / Milu de Mahuay (4,660m) with its stunning vista of snow capped peaks and technicolour open cast mining. After dropping down a little into the Quebrada Milu valley, the next couple of hours were spent contouring along the hill side towards Punta Sacsa / Paso Pasapa Shimin, with the final ascent requiring hands as well as feet. Tiring terrain, but we were rewarded with fabulous views from the pass, albeit blustery ones. The mountains were getting closer…. We picnicked in a sheltered spot on the other side of the pass, and then did a few steep downhill sections to drop into the Quebrada Asiac. A long walk through the green grassland of the valley eventually brought us out into the Quebrada Cuncush which is home to a rough mining road. Here, again, we reaped the rewards of local knowledge as Val and Melky’s route meant that we simply crossed the road …. and then climbed again (Val had forewarned us, but it still hurt!) to the campsite at Quartelhuain (4,200m)… and a little further up to a small cwm/corrie where we were were sheltered from the sight and sound of the 24 hour mining trucks. Probably the hardest day of the trek for me – nothing technically challenging, just our first day with lots of ‘up’ at altitude and a lot of ground to cover. No problems with altitude sickness itself though. 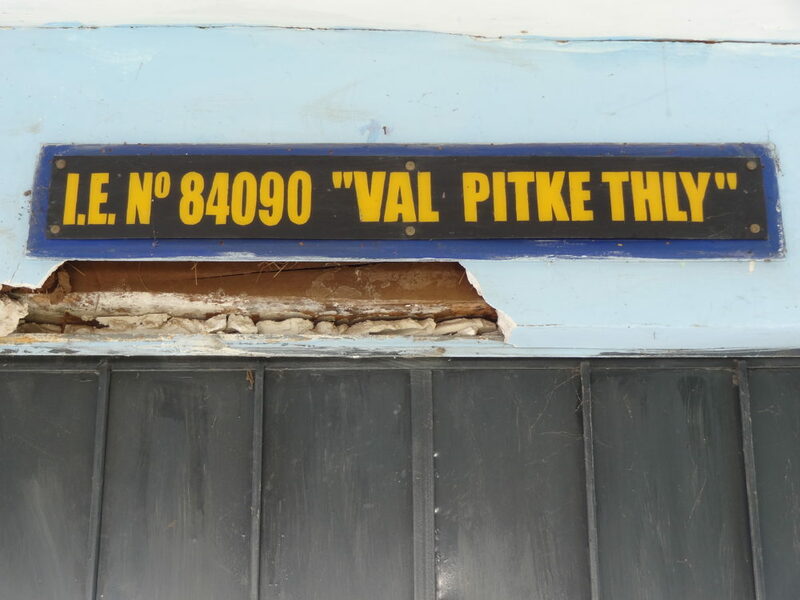 A note on names: I found the KE trip notes not altogether reliable when it came to place names (eg Radiash / Parlash), and I didn’t always remember to make the most of Val’s local knowledge. Transliteration accounts for some of the variations, eg Quartlehuin / Quartelhuain / Cuartelhuain, but others – for example the names of the passes today – seem way out when compared with the map (I was using Alpenvereinskarte map 0/3c: Cordillera Huayhuash (Perú)) and other accounts. A tough start to the day: emotionally, saying farewell to John and Mike; and physically, with the path climbing steeply from our Quartelhuain campsite and up 500m to the Cacananpunta / Cacanampunta at 4,700m. We were rewarded with long views up the Quebrada Cuncush towards Huallanca and down into the Quebrada Caliente on the other side of the rocky ridge which also forms the continental divide: Cuncush is on the Pacific side, Caliente the Atlantic. A steep descent into the aptly named valley of the hot springs, and we made the most of the chance to take a dip in the beautifully warm waters of the stream. After drying off with a cup of coca tea, it was back on the trail again crossing more of the weird, springy, green ground cover on either side of the stream. Better than the prickly, spiky grass mind you! As the Quebrada Caliente neared the valley of the Río Janca, blue skies gave way to cloud which made for limited views of the Cordillera Huayhuash once we arrived at the campsite, which came complete with a toilet block, albeit on the other side of the river… luckily there was a bridge. After lunch, Melky and Stefanie led us through the marshland to the shores of the Laguna Mitacocha (Mitococha / Mituqucha). Some birdlife – mainly black ibis and the local Andrean Wachwa geese – and glimpses of the glaciers and peaks as the cloud lifted a little. Melky told us that a plane had crashed into the massif in similar conditions many years ago. Clear skies overnight made for starlit trips to the loo over a frosty field and bridge. 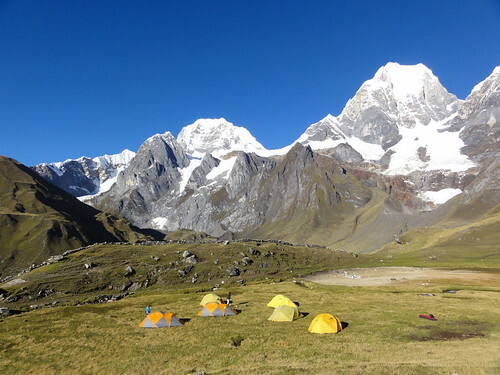 Clear skies overnight made for a frosty morning at our Laguna Mitucocha campsite, and superb conditions for seeing the mountains of Cordillera Huayhuash from the north: Ninashanca (5,607 m), Rondoy Chico, Rondoy / Runtuy (5,870m), Mituraju (5,750m), Jirishanca (6,094m) and Jirishanca Chico (5,446m). The kind of clear blue skies you dream of, setting off the bright white snow on the peaks and ridges. A stiff climb took us out of the campsite and into the gentler inclines of the Quebrada Wayac which was the setting for a lovely morning’s walk, and as we approached the Carhuac pass (Yanapunta on my map) (4,650m) we got fabulous views of Jirishanca (Grande and Chico) from the east. After a photo opportunity at the pass, another, steeper, climb up the slopes of the Cerro Yanayana brought us out on the rim of a gully at 4,740m. Vertigo struck again, but the 360° panorama, mountains, glaciers and lakes were worth it. The rest of the day’s route was mainly downhill as we descended the length of the Quebrada Yanayana, passing ammonite cliffs, sheep pens and waterfowl en route to Incahuain (4,200m), where our tents awaited. Our campsite was perched above beautiful Laguna Carhuacocha / Qarwaqucha with Jirishanca Chico (5,446m), Jirishanca (6,126 m / 20,098 ft), Yerupajá Chico (6,089m), Yerupajá (6,635 m / 21,768 ft) and Siula Grande (6,344 m / 20,814 ft) looming above. Glaciers galore – sound as well as vision. A fantastic setting for a lunch of soup and toasted sarnies, and an afternoon to relax and recharge in the sunshine. Val adjusted the itinerary to make this a much appreciated rest day at lovely Laguna Carhuacocha / Qarwaqucha. 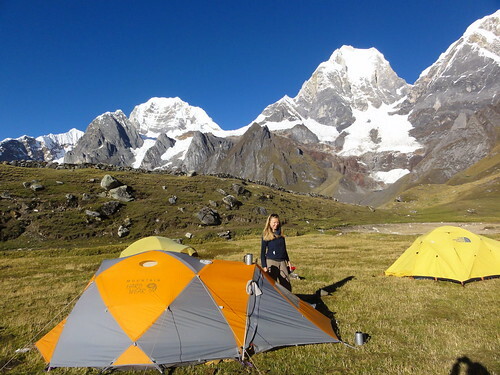 We woke to blue skies and breakfasted al fresco with a fantastic view of Siula Grande (6,344 m / 20,814 ft), Yerupajá (6,635 m / 21,768 ft), Yerupajá Chico (6,089 m / 19,977 ft), Jirishanca (6,126 m / 20,098 ft) and Jirishanca Chico (5,446m / 17,867 ft) – snow topped peaks and fluted ridges, with glaciers reaching down into the valley below. Not that the morning was that restful as we headed off down into the valley to deliver solar lights funded by Val’s charity, Light Education Development, to a local elderly lady who still lives in her smallholding, raising sheep, chickens and cows at the base of the Cordillera. Amazing to see. Leaving Juan to explain the solar lights, we avoided Petronella’s bull and headed off south getting closer to the mountains and crossing the river and climbing up the steep glacial rim of Laguna Gangrajanca, the first of the three glacial lakes that gather at the feet of Siula Grande and Yerupajá. With Juan and Val’s flasks supplying tea (BYO mug), we took in the great views of the lake to the soundtrack of the bangs and roars of occasional avalanches before heading back to lunch at our Incahuain camp. Reaching the river, we spotted Melky, John and Omar tickling trout – Val joined in and we returned with quite a haul. That was dinner sorted! A leisurely afternoon with the sun high above allowed time for washing (clothes and hair), lamb rescue, avalanche watching, reading and snoozing. Once the sun dropped below the ridge though the temperature plummeted and we were back in down jackets for dinner – fresh fried trout and chips. As the trip notes promised, a long but fab day. After breakfast, again with stunning views of Siula Grande (6,344 m / 20,814 ft), Yerupajá (6,635 m / 21,768 ft), Yerupajá Chico (6,089 m / 19,977 ft), Jirishanca (6,126 m / 20,098 ft) and Jirishanca Chico (5,446m / 17,867 ft), we retraced our steps down into the valley of Laguna Carhuacocha / Qarwaqucha and back towards Laguna Gangrajanca. This time, we skirted the glacial moraine and continued south, coming out into the valley alongside Laguna Siula (4,290m), and a little later, Laguna Quesillococha (4,332m). The path then took us up a stiff 500m ascent to Punta Suila (4,800 m / 15,748 ft) where we were rewarded by fabulous views of the east side of the Cordillera Huayhuash – the peaks of Siula Grande et al joined by Nevado Sarapo (6,127 m / 20,102 ft) and Nevado Carnicero (5,960 m / 19,553 ft), with the three lakes nestling below – and a mum and son selling fizzy drinks! After a breather on the pass we dropped down into the Quebrada Atocshayco, bouncing over the weird island cushions of Plantago rigida and occasionally passing/being passed by the Fair Isle-d trekker from Laguna Mitucocha, who turned out to be Austrian. A fast pace brought us round to the south side of the Cordillera Huayhuash, and then to the shores of (a second) Laguna Quesillococha. Soon after we rendezvoused with Hazel and Gayble who, with Melky, Blackie and Co had taken the alternative route along the north side of Laguna Carhuacocha and the south through the Quebrada Atocshayco, getting some fabulous photos en route. Then it was downhill all the way to reach the small hamlet of Huayhuash (4,300m), crossing the stream by way of a stone bridge to reach our campsite. That evening we vicariously celebrated a local lady’s birthday with camp made, chocolate coated Panettone…. more Val magic! An easy morning, following the path from Huayhuash hamlet to the Portachuelo de Huayhuash (4,750 m / 15,584 ft), chatting with Marian all the way. After taking in the views of the Cordillera Raura (C. Rawra) further south we veered back north west and up along the northern buttresses of Nevado Sueroraju for photos and fantastic ammonite fossils. Hazel, Gayble and I then accompanied Juan and Blackie to our camp below the pyramid of Nevado Trapecio (5,653 m / 18,546 ft), in familiar Juan-style, taking the ‘scenic route’, while the others took the longer route with Val ‘over the top’. After a warming lunch (the morning has turned cloudy and cold) we had a relaxing afternoon pottering around camp and later in the afternoon I enjoyed a tranquil twenty minutes or so sitting on the shores of sparkling Laguna Barrosococha watching Trapecio’s shadow fall slowly but surely across the landscape. Lamb chops for dinner for the meat-eaters – we’d watched our trek team arrive with the carcass fresh from Huayhuash…. A steep, zig zag ascent brought us to Punta Trapecio (5,000 m / 16,404 ft), overtaken by our donkey train en route. 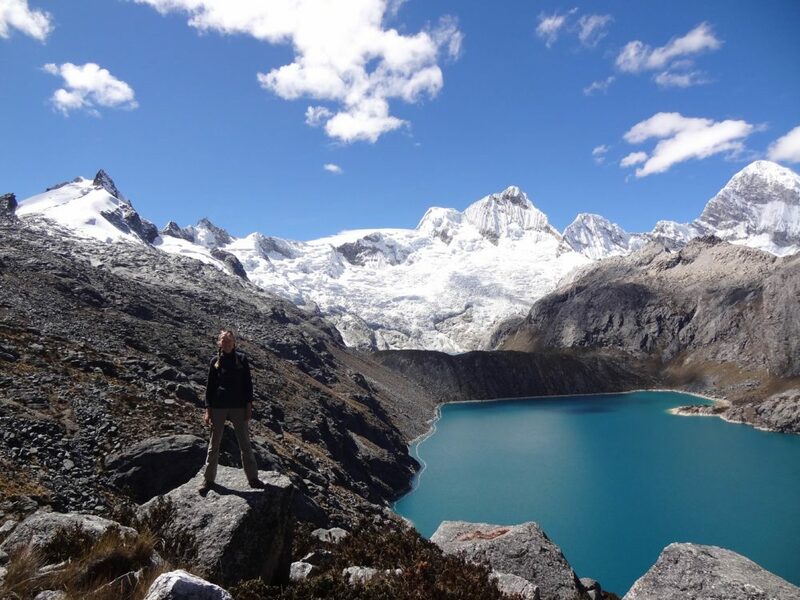 At the pass we were rewarded by fabulous views of snowy Trapecio and the Cordillera Raura (C. Rawra), and Puscanturpa, the beautiful blue lakes contrasting with the beige and grey buttresses of Nevado Cuyoc (aka Puscanturpa Sur, 5,550 m / 18,209 ft). A scramble up over the rocks and snow to our west brought us up close and personal with the Cordillera Huayhuash – amazing even with the peaks shrouded in cloud. With the wind picking up, we scooted back down to the pass and on down towards Puscanturpa, lunching in a sheltered spot down at lake level and then continuing on downhill, eventually reaching the flat lands alongside the Quebrada Huanacpatay / Quanacpatay. Camping at the head of the valley at 4,500m in the company of a lone French alpiniste, we had to tackle a tricky ascent whenever we felt the need to make use of the two loos perched on a ledge at the valley’s end …. A fantastic day, trekking from our campsite at the head of the Quebrada Huanacpatay / Quanacpatay to our next camp at Cototambo (Cutatambo on my map) (4,230m) the hard way…..
A faint zig zagging path over scree and then straight up alongside a narrow watercourse brought us into an upland valley, and then it was up and over a no name, 5,080 m / 16,666 ft dip in the ridgeline of Cerro San Antonio. From the ridge pass we had amazing views of the south western side of the Cordillera Huayhuash, including Rasac / Rasaq (6,017 m / 19,741 ft) and Sarapo / Sarapu (6,127 m / 20,102 ft), the glaciers of the Nevado Jurau and the lakes of the Quebrada Sarapococha (Lagunas Sarapococha / Sarapuqucha / Sarapaqucha and Santa Rosa / Rurigollay), Laguna Juraucocha (4,343 m / 14,248 ft) and the colourful, mineral rich rocks high above. The route down from the pass to our lunch spot at Laguna Juraucocha featured steep scree slopes, steep hill side, large boulders and a family of vicuñas. After a late lunch in the lee of a boulder by Laguna Juraucocha, we split forces with Hazel, Gayble and I continuing on with Val to our Cototambo camp whilst the others headed off to explore the Quebrada Sarapococha with the plan of reaching Siula Grande base camp. I found today tough – paying for yesterday’s exuberance I suspect. The morning began with what should have been an easy trek due west from Cutatambo / Cototambo (4,230m / 13,877 ft) along the valley of the Rio Calinca to the village of Huyapplla / Huayllapa (3,490 m / (11,450 ft), but it tired me out even though it was relatively level to begin with and then dropped steadily down toward the village. We met lots of other trekkers for the first time too, and later on a family out on a weekend stroll up to Huatiaq. Leaving Val, Yvonne and Marian to go into the village – definitely prosperous given the bright corrugated metal roofing – the rest of us started the ascent up alongside the Quebrada Milo. Even with Blackie carrying my daypack I found the climb exhausting, and I was very glad to see the tents at our streamside campsite at Whatia / Huatiaq (4,250 m / (13,943 ft) with views up to the snowtopped peak of Diablo Mudo (aka Raju Collota, 5,350 m / 17,552 ft) ahead. We woke in Whatia / Huatiaq (4,250 m / (13,943 ft) with clear (and cold) views up to Diablo Mudo (aka Raju Collota, 5,350 m / 17,552 ft) and beautiful iridescent clouds. Another relatively hard going day for me, although our route wasn’t tricky at all – I’d just legs like lead, despite all the food! That said, the route up to the Punta Tarpush (4,800 m / 15,748 ft) (Tapush Punta on my map) was more straightforward than I’d expected from the view up the Quebrada Huatiaq. The 360° view from Cerro Jyamy (5,000 m /16,404 ft) was stunning; not just the magnificent snowy peaked range of the Cordillera Huayhuash from the west – from Raju Collota (Diablo Mudo) in the south to a new view of the mighty peaks of Yerupajá (6,635 m / 21,768 ft), Yerupajá Chico (6,089m) and Jirishanca (6,126 m / 20,098 ft) to the north, via Huacrish (5,622 m / 18,444 ft), Tsacra Grande (5,774 m / 18,943 ft) and Tsacra Chico (5,548 m / 18,202 ft), Rasac / Rasaq (6,040 m / 19,816 ft) – but Huascarán (6,768 m / 22,205 ft) and in the distance, the peaks of the Cordillera Blanca (next year!). It wasn’t surprising I’d not found the mountain on the map (it’s part of the Cerro Patococha Grande on the Alpenvereinskarte map 0/3c: Cordillera Huayhuash (Perú)) nor any mention of it online before leaving London as Val named the peak after Omar’s dad Jyamy as they’d scouted the route together. 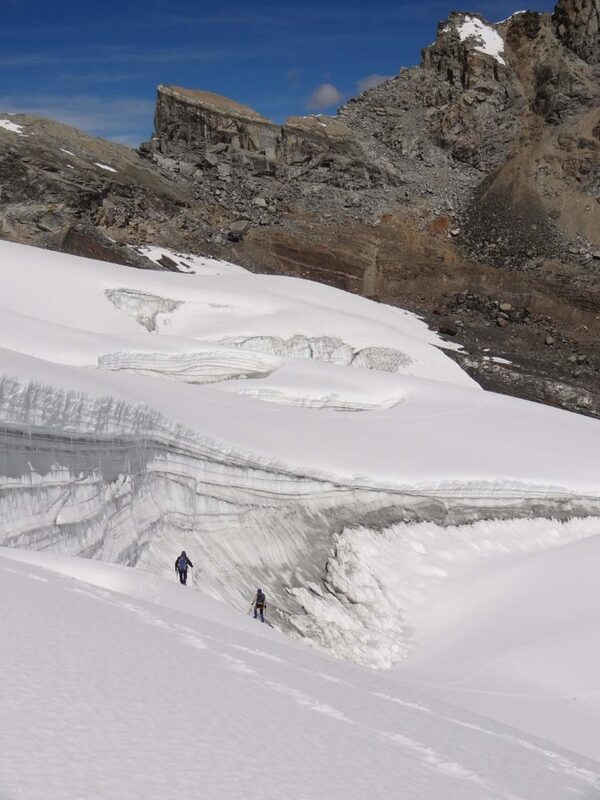 Contrary to the trip notes which talk about crossing “easy scree slopes [true] to reach the snow line and then … follow an easy-angled snow slope to the top“, Cerro Jyamy hasn’t seen snow for a while. No ice axes or crampons required here. After we’d made the most of the photo opportunities, we descended along the ridgeline and then steeply down rendezvous with Juan, Gayble and Hazel. After a breather and a song from Juan, we continued on down across the hillsides to Gashpapampa camp. Popular with groups doing an ascent of Diablo Mudo, there were a trio of colourful harlequin tents set up a fair distance away, and our lone French trekker was there too. Oops, my memory’s got my mornings muddled: today was the morning with the beautiful iridescent clouds. Leaving Gashpapampa campsite (4,500 m / 14,763 ft) long after the other group (who’d left in the wee small hours to make their ascent of Diablo Mudo / Raju Collota (5,350 m / 17,552 ft)) we headed downhill, north along the Quebrada Gashpapampa / Gashpampa before turning due east to trek up the Quebrada Angocaucha to the Llaucha Punta / Paso Yaucha (4,850 m / 15,912 ft). Goodness knows how the trip notes call it Punta Jahuacocha. 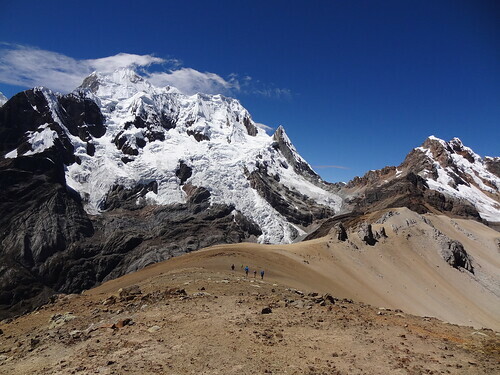 A zig-zagging ascent that proved a hard slog for my leaden legs, but – yet again – the blue sky views of the western flank of the Cordillera Huayhuash were worth it. Naturally, most of us did the “optional scramble takes us to a small peak with magical views of the Huayhuash” and indeed they were…. 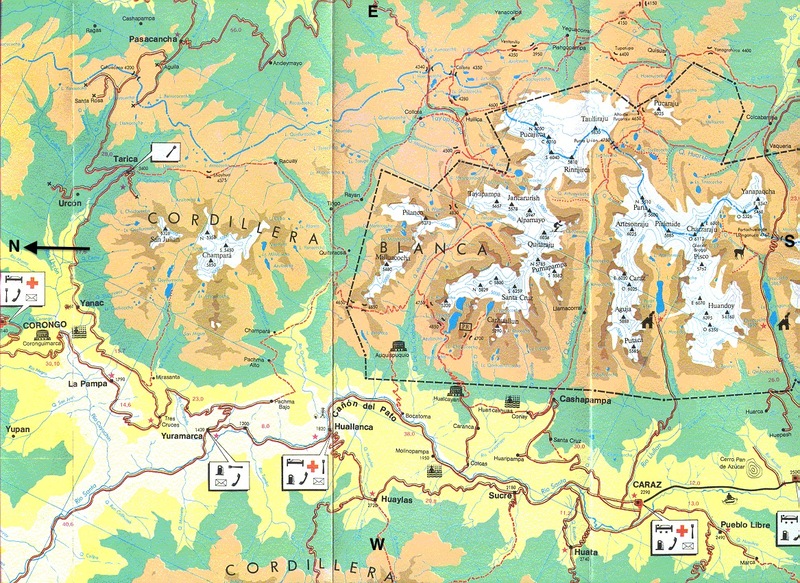 Yerupajá (6,635 m / 21,768 ft), Yerupajá Chico (6,089m) and Jirishanca (6,126 m / 20,098 ft). I think we may even have even have included Siula Grande in that list. 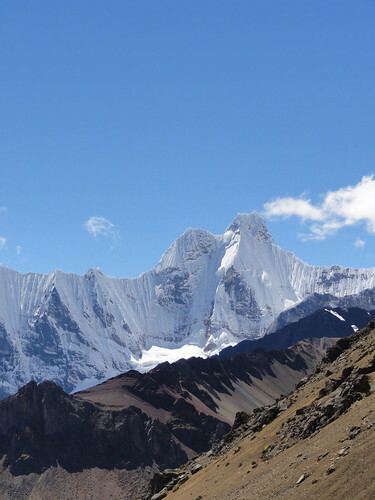 The trip notes don’t lie when they say it’s “A steep descent” from the pass to the camp in the Quebrada Whacrish / Huacrish (4,350 m / 14,271 ft) – for a lot of those 500m down the downhill slope wasn’t far off vertical. They make no mention of the plethora of cow pats though…. After a lovely lunch, Hazel and I took advantage of the (ice cold) stream and the afternoon sun to do a spot of laundry. The temperature plummeted once the sun dropped below the high ridges around us, and as night fell the last of the day’s sun turned the snows above a rosy pink. Another day of hard, high altitude trekking, rewarded with magical views of the Cordillera Huayhuash, getting close up and personal with Yerupajá (6,635 m / 21,768 ft) and Rasac / Rasaq (6,017 m / 19,741 ft), and ending up on the shores of Laguna Jahuacocha / Hawaqucha (4,050 m / 13,287 ft). We woke to frost on our tent, and frozen waterbottles in the porch. Leaving our Whacrish / Huacrish campsite we followed along the stream up into a side valley (possibly the Quebrada Tsacra, although Val’s annotation on my map say otherwise), and were soon climbing up, up, up, eventually emerging on a stony plateau which suggested the surface of Mars. 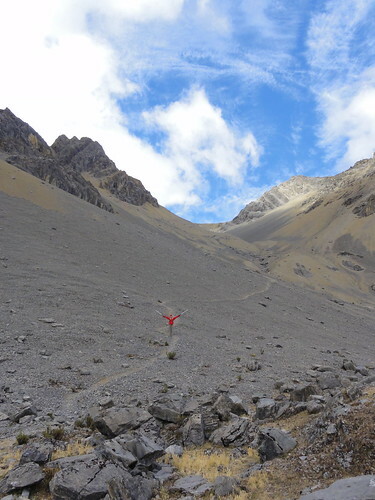 After photos of the views of Tsacra Chico and/or Tsacra Grande, we turned north, passing a shallow pool and then zig zagging up the side of a steep scree slope…. 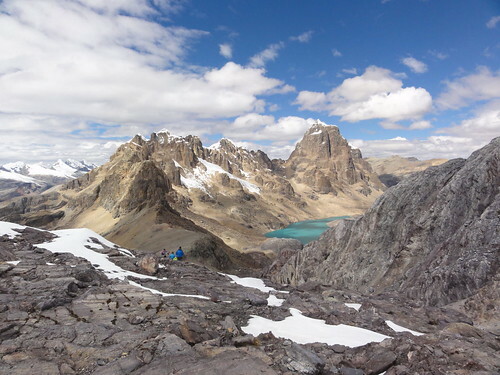 emerging to fabulous views of Yerupajá and Rasac / Rasaq, and a crystal clear view of the ridge connecting Jirishanca (6,126 m / 20,098 ft), Ninashanca (5,607 m / 18,395 ft) and Rondoy / Runtuy (5,870 m / 19,258 ft). To the west, a swathe of deep rose pink rock cut across the mouth of a col opening out onto the Quebrada Whacrish / Huacrish. Our long descent to lunch at Rasaqcocha started with a speedy scree ski (which Hazel most definitely wouldn’t have enjoyed) and continued at a fast pace over/down steep grassy hillsides to bring us into the Quebrada Rasac. After our sandwiches the descent continued, initially over rock, then paddling across the freezing stream and then on down a dusty path which brought us to the Gocha Cutan (4,066m), the marshland between the lakes of Solteracocha and Jahuacocha, and Hazel and the boys, armed with sticks in anticipation of a spot of trout tickling for supper…. 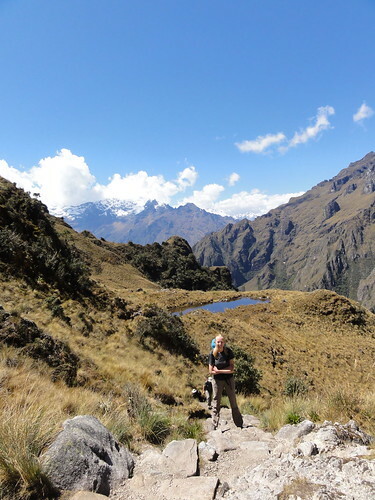 A lovely, level walk along the south bank of the Jahuacocha, past waterfalls cascading down from the upland valleys above, led to the camp at Incahuain. At the campsite our tents awaited, looking back east along the valley across the clear waters of the Rio Jahuacocha and its laguna and on up towards Jirishanca and Rondoy / Runtuy, horses grazing in the rich pastures below. Beautiful. An evening tinged with sadness as we paid our thanks to the trek crew – tomorrow would see us complete the Cordillera Huayhuash Circuit and say farewell to our lovely team. Val’s spidey senses predicted rain in last night’s red sky clouds, so we were up and away early walking along the wide valley of the Rio Jahuacocha before the sun rose above the Huayhuash. Climbing up out of the valley, through clusters of twisted queñuale (paperbark) trees, we gained views as well as height: behind us the crisp, snowy peaks of the Cordillera; below and ahead, the narrow gorge of the Rio Achin. After a final photostop at Pampa Llamac Pass (4,300 m / 14,107 ft) we dropped over 1,000m down to the roadhead at Llamac (3,250 m / 10,662 ft). Today was tough on the knees, as well as our spirits – Llamac brought us back to civilisation (of sorts), and the end of a fabulous trek. After a few farewell beers / fizzy drinks at a village shop we boarded the bus and – after a lengthy stand off at the road barrier – started the 5 hour drive back to Huaraz. Sad, even with the prospect of a shower back at the Hotel Colomba. Back in Huaraz, we washed off the accumulated grime (the colour of the bath was something to behold) and headed into town with Val to get some laundry done. We had no trouble keeping up this time. Foiled by the fiesta, we adjourned to Café Andino for a celebratory Sierra Andina cerveza (me), coffee (Hazel and Val) and nachos. For dinner we returned to the lovely El Rinconcito Minero, where I went for a repeat serving of very tasty veg fried rice, which Marian and Yvonne had indeed been dreaming of since our first meal there 17 days earlier. 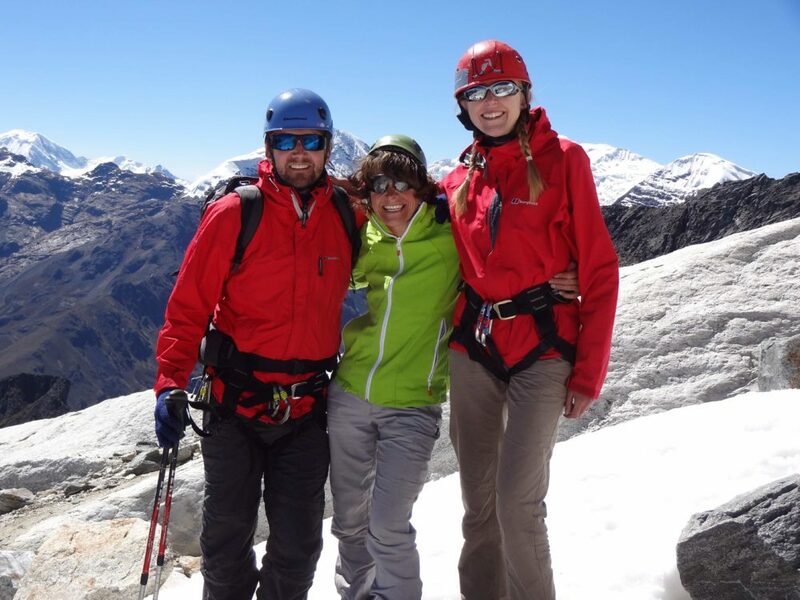 After a final breakfast feast at the Hotel Colomba we said a heartfelt au revoir to Val, who was staying on in Huaraz to prepare for her next circuit…. The drive back to Lima was day 02 in reverse, complete with lunchtime stop at Cheto’s. After checking back in at the Faraona Grand Hotel we ended up strolling down the road for a final group meal at a fancy Italian restaurant. Expensive pizza! Early morning taxi from the Faraona Grand Hotel to the airport, arranged by Val who phoned for a catch up en route. Luckily we were able to bring forward our scheduled flight to Cusco, arriving there before we were even due to have left Lima. I think our comfort with Cusco’s relatively low (!) altitude (3,399 m / 11,152 ft) threw our transfer taxi driver, whose standard patter relied on arrivals feeling the effects of the thin air. We did find it relatively chilly though. Amaru Hostal proved delightful and a great base to explore the cobbled streets and for scoffing pastries from the Panadería El Buen Pastor; the hassle of getting cash out to fund our Inca Trail trek to Machu Picchu less so. Cheers Lloyds TSB (as was). On the plus side for us and our future trek mates, we did manage to find a lavandería that would do an express wash – otherwise we would have faced the prospect of spending another 7 days in our well worn Huayhuash kit…..
Our dinner at a mexican restaurant across the road from the hotel proved to be Hazel’s last meal from many days – last night’s meat pizza gets the blame. A disappointing day, which in some ways set the tone for all our non-trek days on KE’s Inca Trail and Machu Picchu trip (I wrote more on this when we first got back). Our trek leader, Julia, had met us at the Amaru Hostal yesterday to give us a briefing and to hand over our 8kg max kit bags. Packing light was not a problem, but finding out we were the only people booked on the KE trip had been, and today the “full day of sightseeing [in the Sacred Valley] visiting Inca sites with a local guide” promised in the trip notes turned out to be a day trip on a big coach largely full of day trippers from Cusco. As a result, the morning featured a series of tourist-geared shopping stops (not a true local market to be seen). Seeing Julia giving a guided tour to a party of four (the gents were to turn out to be our Inca Trail co-trekkers John and Lonnie) at the Inca ruins at Písac really rubbed salt into the wound. If Hazel and I had wanted this kind of experience, we would have booked directly with an operator in Cusco, and paid a lot less. The local operator for our trip was ExploreAndes, so if you like the sound of it you can book direct. Still, looking on the bright side, the Inca terraces and village ruin at Písac were impressive even under cloudy skies, and things picked up once we got to Ollantaytambo where we had a guided tour of the Inca old town and ruins before being deposited at the lovely Tunupa Lodge. To be honest, it did feel a bit like being abandoned… all we knew was that Julia would pick us up at 8am the following morning. After a stroll around the town and buying water supplies, we ate at Hearts Café – highly recommended. Our first day proper on the Inca Trail started with a minibus pick up from the Tunupa Lodge, and our first meeting with John and Lonnie – two lovely American gents who were doing the trek while their wives headed down to the Amazon. At Piscacucho (Km. 82) we met our trek crew and started walking. Unlike the other groups we saw during the day, our route kept to the right of the Urubamba River. This extra half day section meant that we were out of sync with those walking the standard route, and for the whole trek up until our final camp at Phuyapatamarca (3,650m) we only saw one other trekker, and she was heading back to Ollantaytambo having given up the trek. 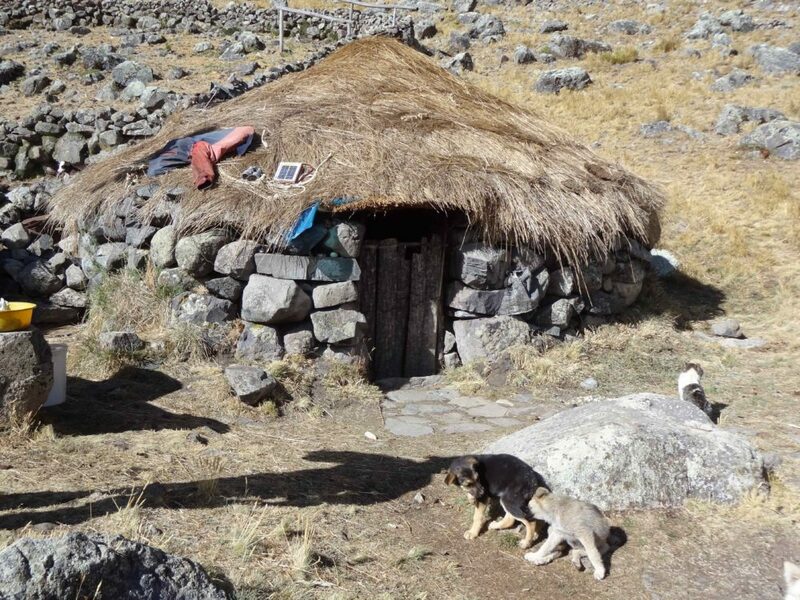 Our morning route took us through fields and villages following the railway (and sometimes walking on it), pausing for a snack at the small scale Inca ruins at Qanabamba and, a little later, lunching in our private dining tent. I have to say the food on the trek was fabulous – probably better than it needs to be. We had a hot lunch, freshly prepared, every day, and a hearty afternoon snack (tasty guacamole and fresh fried corn chips were a favourite, and freshly made each time). At Q’oriwayrachina we cross the river and entered the UNESCO World Heritage Site of the El Santuario Histórico de Machupicchu, getting the first of our official SERNANP checkpoint stamps en route. Not long after we reached the end of the day’s trek (more of a stroll really – but it was easy to forget we’d had 3 weeks acclimatising and getting fitter), arriving at the village of Patallaqta / Llactapata. After settling into our new tent, I explored Patallaqta’s impressive Inca ruins in lovely late afternoon light, and returned to camp to find Julia and Lonnie playing kickabout football with twin girls from the family in whose field we camped. Day 2 on the Camino Inka brought beautiful blue skies. Leaving Patallaqta / Llactapata we walked up the increasingly narrow valley of the Cusichaca / Kusichaka River. Early sections took us between farmland and villages, with views back down the valley to Nevado Verónica (5,860m/19,225ft) aka W’akay Willca or Willka Wiqi, and were relatively easy going – ie not too steep. After a breather in Wayllabamba / Huayllabamba (2,912m), the last inhabited place on the trail and home to another SERNANP checkpoint, we turned away from the valley of the Cusichaca / Kusichaka and started following the route of the Llulluch’a / Llulluchayoc river …. and the climb began in earnest, the path varying from packed earth track, to dusty trail, to (possibly Inca) stone steps. After another hot lunch (both food and dining tent) at Ayapata (another SERNANP campsite), we continued upwards through cloud forest and past llamas before arriving at our at Llulluch’apampa / Llulluchapampa campsite (3,650m). Clear views down the valley, and a smashing wash / loo block at short stroll away. We were the only people there. Noticeably colder up this high. Day 3 on the Camino Inka features the (in)famous Abra de Huarmiwanusca / Warmiwañusca (4,200 m / 13,780 ft) aka Dead Woman’s Pass – the highest point of the trek. The condition of the trail and our Huayhuash acclimatisation made the 550 m ascent from the Llulluch’apampa / Llulluchapampa campsite easy going. Great views from the pass, both back down the valley we’d ascended and also ahead into the Pacaymayo valley, which featured a LOT of stone steps….. These were to prove hard going on the knees as we dropped 800 m to the Pacaymayo Alto campsite (3,595 m). After coffee and an early sandwich at the Pacaymayo checkpoint it was time to start climbing again, with the small circular Inca tambo (inn) at Runkurakay / Runccuracay (3,760 m) providing a beacon to aim for, and then more up to reach the Runkuraqay / Runccuracay Pass (3,985 m) by which time the views were a little less good, as cloud clung to the peaks of the Vilcabamba range. According to the trip notes the post-Runkuraqay / Runccuracay Pass section of the path is “paved with the original Inca stones” – my main memory is of our first Inca tunnel, yet more steps, colourful flowers and – in time – the Inca ruins at Sayaqmarka / Sayacmarca (3,625m) “the place with a dominant view”, which we didn’t visit. Not long after Sayaqmarka / Sayacmarca the path entered beautiful bamboo forests. Very zen. A leisurely lunch at Chaquiqocha (3,576m) looking out over the Aobamba Valley, and then onwards through forests, Inca tunnels and – eventually – our final campsite, Phuyupatamarka / Phuyupatamarca (3,650m). En route, a few flashes of bright green as packs of parakeets wooshed by, beautiful flowers and a stunning section of colourful moss covering the cliffside. The clouds gathered too. The aptly named ‘Town in the Clouds’ camp proved to be packed, understandably so once we saw the views further south, not just the Inca ruins just below the campsite, but ridge upon forested ridge, snow sprinkled to our east, dramatic sunlight streaked clouds, rain and rainbows, and the first mobile phone signal since Ollantaytambo (probably – I didn’t have my phone with me) courtesy of Aguas Calientes nestling in the Urubamba Valley 1,610 m (1 vertical mile) below. All in all the best day of the trek by some margin. According to my calculations we climbed (and descended) over 1,000m / 3280 ft over the course of the day despite there being no net change in altitude. Our last day on the Inca Trail turned out to feature a lot of Inca site sightseeing en route to Inti Punku – the Sun Gate – and Machu Picchu (2,400m) itself. After breakfast we said farewell to our porters and kitchen crew and tackled the 3000+ stone steps down through the jungly-forest to Intipata, aka Sunny Slope. There we sat on one of the terraces enjoying the view out over the Willkanuta /Urubamba River and, to a lesser extent, the over-zealous attentions of the local llamas. Next up, the Inca ruins at Wiñay Wayna followed by an early lunch at the adjacent camp before a long, winding section hugging the forested mountain slopes and providing plenty of opportunities to photograph some of the many species of the Wiñay Wayna (Forever Young) orchid, and lots of other flowers too. A final set of steep stairs brought us to Inti Punku where John and Lonnie were reunited with their wives, and we were all rewarded with the classic views out over the ruins of Machu Picchu. Leaving John, Lonnie and Co at their hotel (H and I concluded we were definitely on a second rate package compared to theirs! ), Julia led us to (and left us at) our hotel – Inka Town – which turned out to be located right next to the train station. This meant we heard every train horn blast and every PeruRail departure warming up (the last is at 9.30pm, the first at 5.35am) – not ideal after a 4 day trek (coming on top of the Huayhuash too, we were both tired). The hotel staff were lovely, and the room itself fine – but all we really wanted was an undisturbed night’s sleep. The complimentary ear plugs in the room weren’t reassuring. Whilst we’d see John and Lonnie tomorrow for our guided tour of Machu Picchu, it was weird being back to the two of us again so abruptly, and not having had celebratory drinks or a group meal to mark the end of the trek. After a good shower (other than location, Inka Town gets most things right! ), Hazel and I headed out to explore the mean streets of Aguas Calientes. Lots of tourists, lots of people wanting you to come into their restaurant/bar/shop. Later on that evening I had a celebratory beer, although Hazel stuck to tea; and our dinner venue proved a poor choice, somewhat lacking in terms of value for money and ambiance… All in all Aguas Calientes proved a bit of a let down. Guided tour of Machu Picchu – bus back to Aguas Calientes – lunch and loitering – late afternoon train back to Poroy (not Ollantaytambo) – taxi transfer back to the lovely Amaru Hostal in Cusco. …. belatedly, as Hazel and I actually landed on Saturday evening, but first thing on Sunday Phil and I headed over to Bristol for Cam and Dave’s wedding and I’ve only just got on top of unpacking and washing, and downloading my 1862 photos. The Huayhuash Circuit was great – a fab group, plenty of good food from Antonia and Melky (and the occasional mulled wine, freshly brewed coffee, home baked panettone by Val! ), interesting routes, nice big snowy mountains and good weather (a bit cloudy at times, but that provided good sunscreen – and we missed the stair rod rainstorms that bookended our trek). Physically harder than the Everest Circuit, primarily because once we’d acclimatised Val set a faster pace and took us on routes that weren’t well trodden paths (no complaints there at all), and partly because the camping means you don’t always sleep so well, get rested etc. 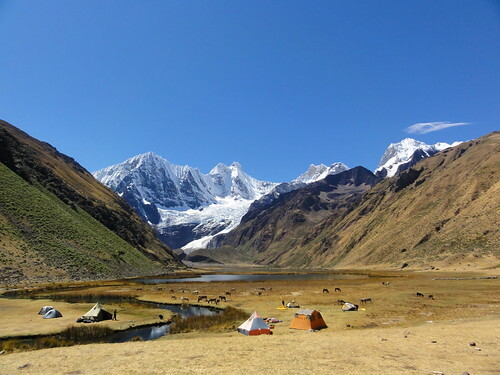 But we got some fabulous views and hardly saw a soul other than Quechua villagers/homesteaders for 16 days… Highly recommended, although probably not as your first experience of trekking at altitude and/or camping. I’d trek with Val again like a shot. 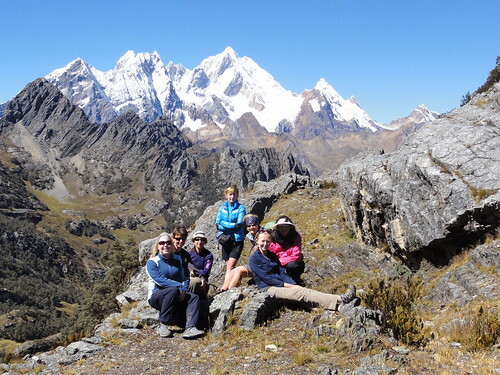 The Inca Trail / Machu Picchu was easy in comparison – big paths, slow pace, but mainly because we were reaping the benefits of having acclimatised to higher altitudes so thoroughly in the Huayhuash. The trail itself and campsites were surprisingly people-free and we saw no other trekkers until the last campsite and the following (final) day’s walk to the Sun Gate. The routing on the first day essentially ensured we were half a day out of synch with the traditional route/timings. Totally unexpected, and fantastic. That said, I did feel rather let down by this trip, and in particular the fact that Hazel and I turned out to be the only people booked on it. As a result we didn’t have a true group trip experience, which is why we’d booked via KE rather than directly with a local agent. Whilst the trekking days (3, 4, 5 and 6) were spent in the company of two American gents whose travel agent had also booked them on the Inca Trail with the same local agent, on day 2 we were simply part of a large day trip coach tour, and on day 7 after the guided tour at Machu Picchu we were left with tickets and instructions as to getting the bus back to Aguas Calientes, the late afternoon train back to Poroy and a taxi transfer to our Cusco hotel, and our airport transfer pick up on day 8. Hazel and I are well travelled enough not to have been worried by this – but we did feel somewhat abandoned. 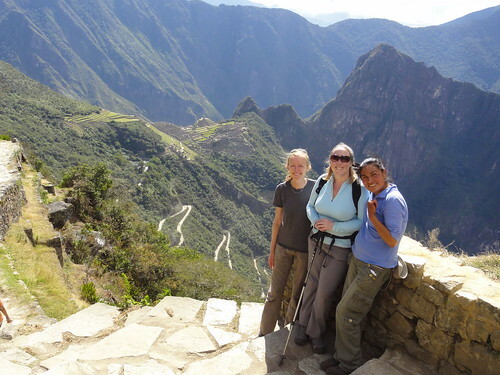 See Cordillera Huayhuash Circuit plus Inca Trail to Machu Picchu: we’re booked! for the background.